After more than two decades and 20 million albums sold globally, Counting Crows will celebrate 25 years of making music by hitting the road for a worldwide 25 Years and Counting Tour, starting with a 40+ city trek across North America this summer. Presented by Live Nation, the tour will begin June 27th in Boise, ID and travel across cities such as San Diego, Las Vegas, Denver, Atlanta, Tampa, New York, Boston, Toronto and Chicago before concluding September 22nd in Nashville, TN. Joining the tour is multi-platinum band +LIVE+. Tickets for the tour will go on sale to the general public in select cities starting Friday, April 6th at 10 am local time. 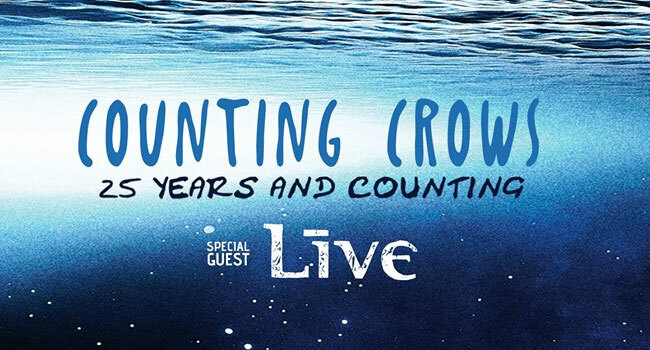 Counting Crows and +LIVE+ fan pre-sales April 3rd at 10 am local time. Please see below for full tour itinerary. In addition to celebrating 25 years of music in 2018, Duritz has also launched a new podcast, Underwater Sunshine! – a series of conversations between noted non-journalist Duritz and his pal, author and music journalist James Campion, about life, music, and whatever comes into their large and incredibly handsome brains. The weekly podcast, published every Monday, currently holds a five-star rating.